Last September, William Rubel challenged Facebook group members of “Bread History & Practice” to gather acorns, and use them for bread baking. I was intrigued – the huge European oaks in our neighborhood had produced a bumper crop of acorns this year. Squirrels and pigs love the fat kernels, but acorns are too bitter for human consumption, unless the tannins are leached out of them. This process, as described in “Acorns: The Inside Story”, is easy. Soaking ground acorns in cold water (instead of boiling them) works best for bread making, since the meal retains it binding qualities. I gathered a bag full of acorns, and left them for several weeks on our porch to dry – the kernels shrink a bit, and are easier to remove from the shells. 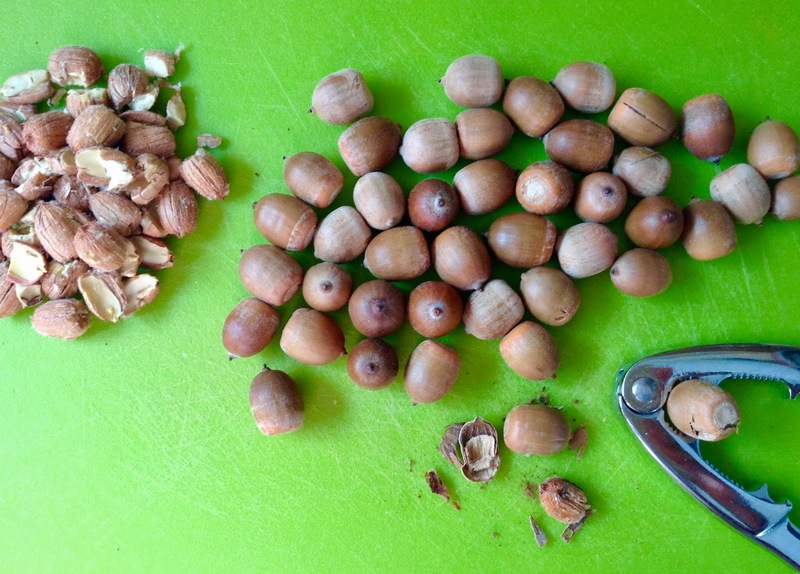 With a nutcracker, the acorns could be cracked like hazelnuts, and I ended up with about half a pound of kernels. First I ground the acorns with water in the food processor, then rinsed the meal in a fine-mesh strainer, before transferring it to a bowl and soaking it in a lot of cold water. Three times a day I rinsed and drained the acorn meal, and changed the soaking water. After two days I started testing the meal for bitterness, and finally, after three days of leaching, the tannins had been washed out, and the meal tasted similar to walnuts, but a bit milder. The wet acorn meal had to be dried. I used my dehydrator (lowest setting), or you can spread it out on a baking sheet and dry it in the oven, at very low heat. Now I had my meal, ready to use. But what kind of bread should I bake with it? The author of “Acorns: The Inside Story” offers a simple skillet bread, but I wanted a real loaf with a nice rise. 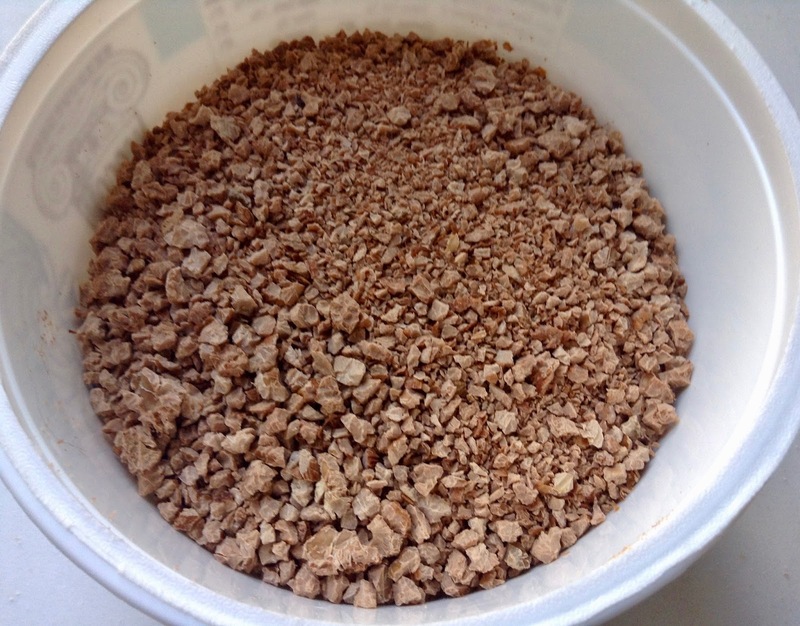 The percentage of the acorn meal should be high enough to be discernible, without compromising the structure. My usual to-go bread is a Tartine-ish kind of loaf, with high hydration, long fermentation, and baked in a Dutch oven. 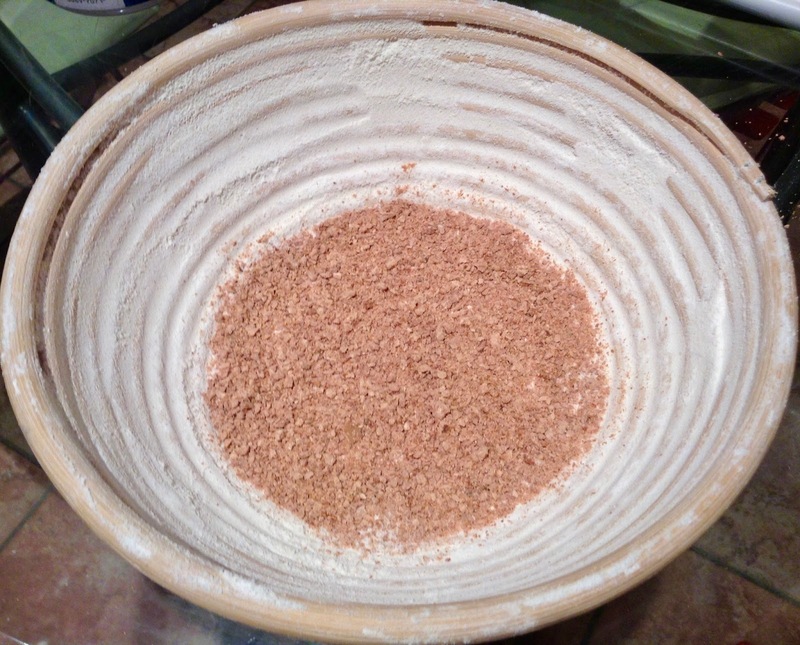 I adapted one of Chad Robertson’s formulas, using a mix of whole wheat, bread flour and 16% acorn meal. 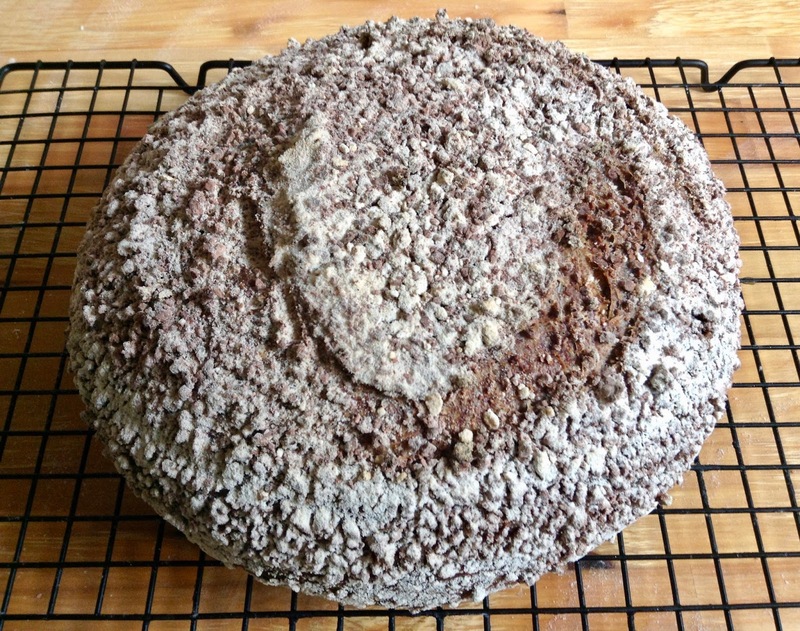 My acorn levain turned out very nice – a hearty, slightly nutty loaf with a crisp crust, fairly open crumb, and a dark, reddish color from the acorns. Good for sandwiches and, also, for toasting. Next year I will channel my inner squirrel again! If you want to try it, but can’t get acorns – you can purchase acorn flour online, but it costs a fortune: $28 – $32 per pound. 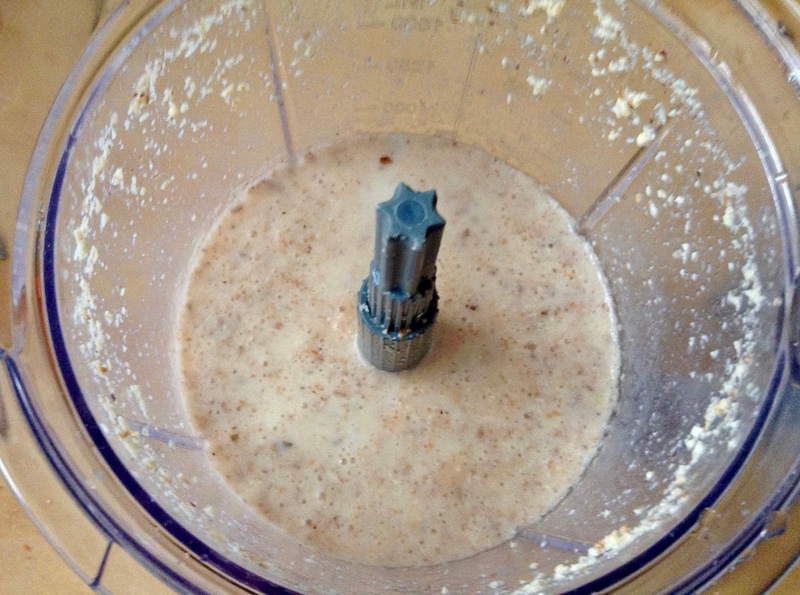 Whisk together flours, acorn meal and wheat germ in medium bowl. 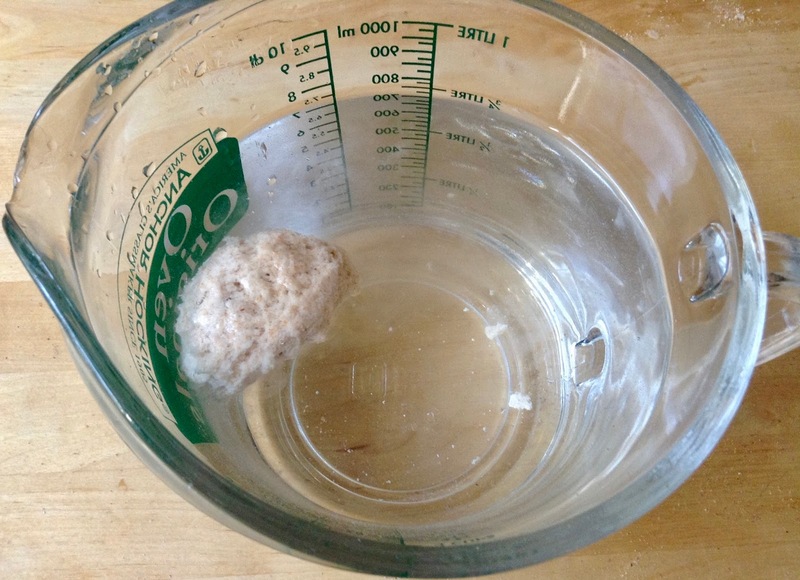 In large bowl, dissolve starter in 430 g/15 oz of the water. 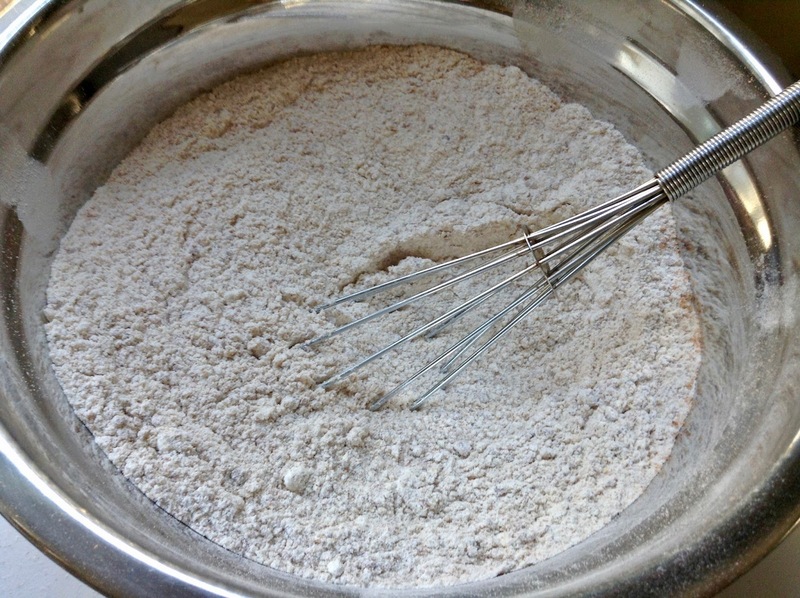 Add flour mixture to bowl with starter and stir (I use a Danish dough whisk) until all flour is hydrated. Let dough rest for 30 minutes at warm room temperature. 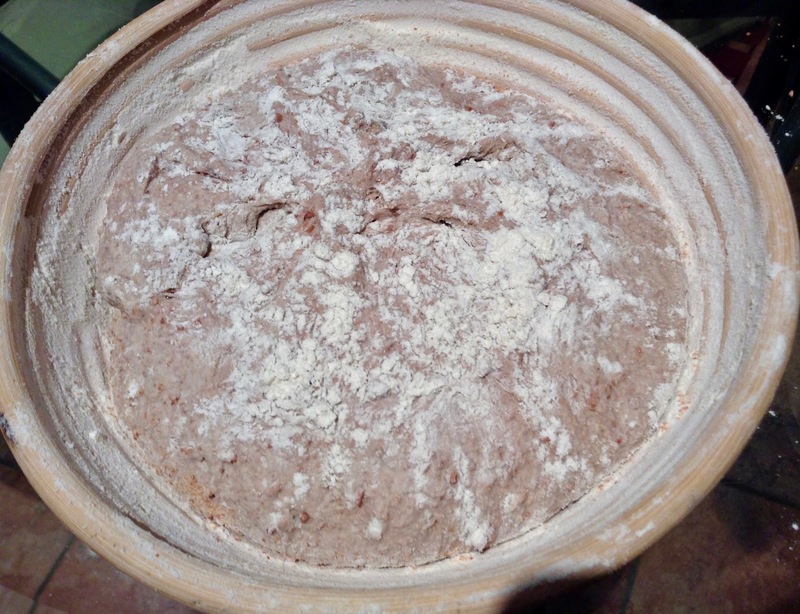 Add salt and remaining slightly warm water, pinching and folding dough in the bowl to incorporate (as described here for Einkorn Hazelnut Levain). 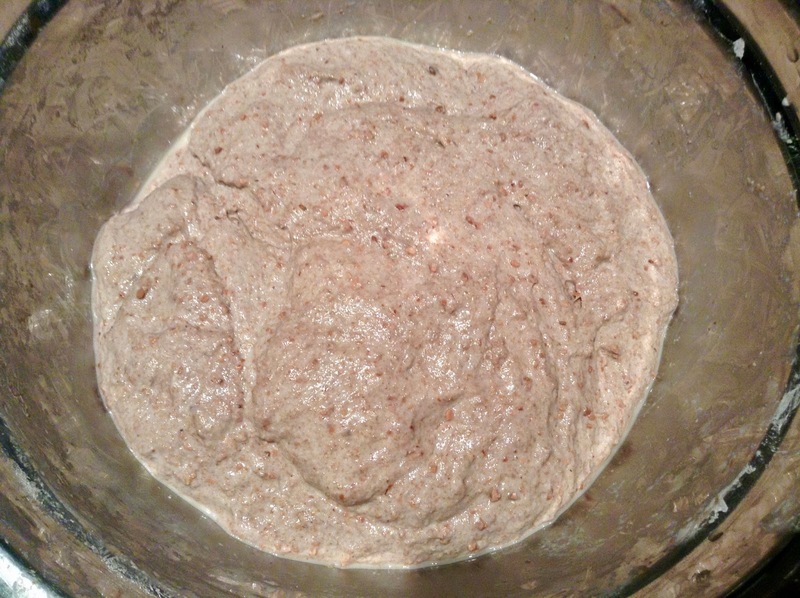 Let dough rise for 3 hours (DDT: 80-85ºF/26-29ºC), stretching and folding it in the bowl, 6 times at 30 minute intervals (I use a wet bowl scraper). 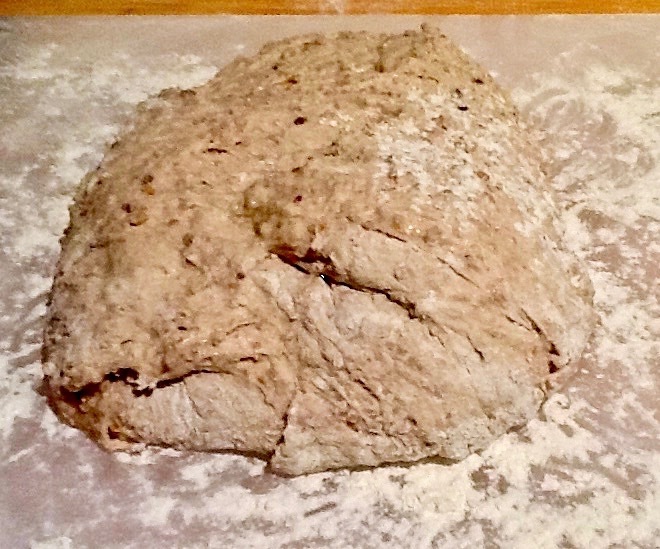 Risen dough – it will be sticky! Sprinkle half of the work surface with flour, leaving the other half free. Transfer dough to the floured part. Lightly flour top. Using oiled spatula(s), work dough into a round by drawing the spatula(s) around the side in circles to create surface tension. 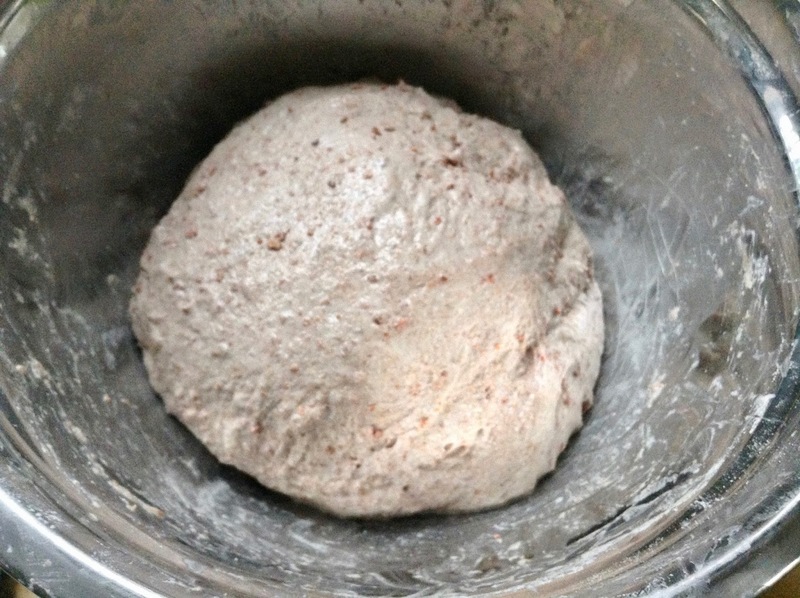 (Dough round should be taut and smooth). Re-flour top, cover dough (I use the empty bowl), and let it rest for 20 – 30 minutes. 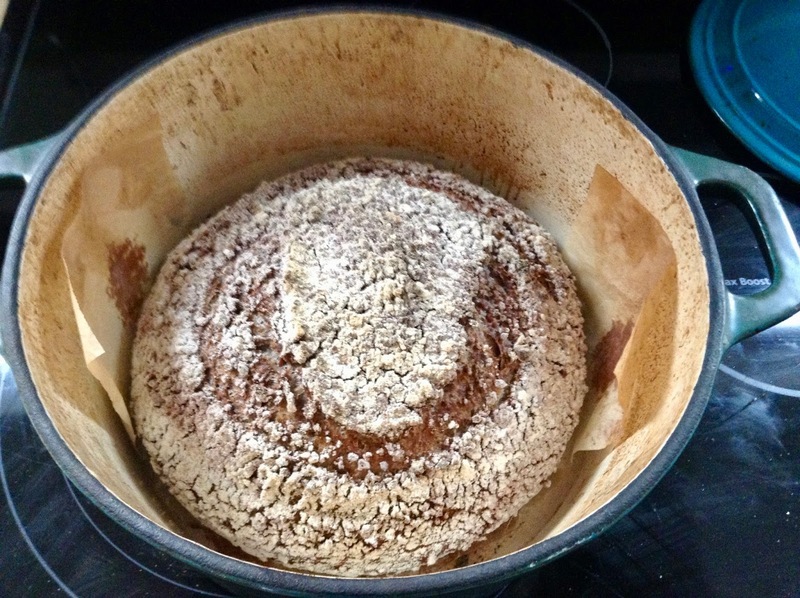 Generously flour rising basket with a 50/50 wheat and rice flour mixture. Sprinkle a layer of acorn meal on the bottom (looks nice and prevents sticking). 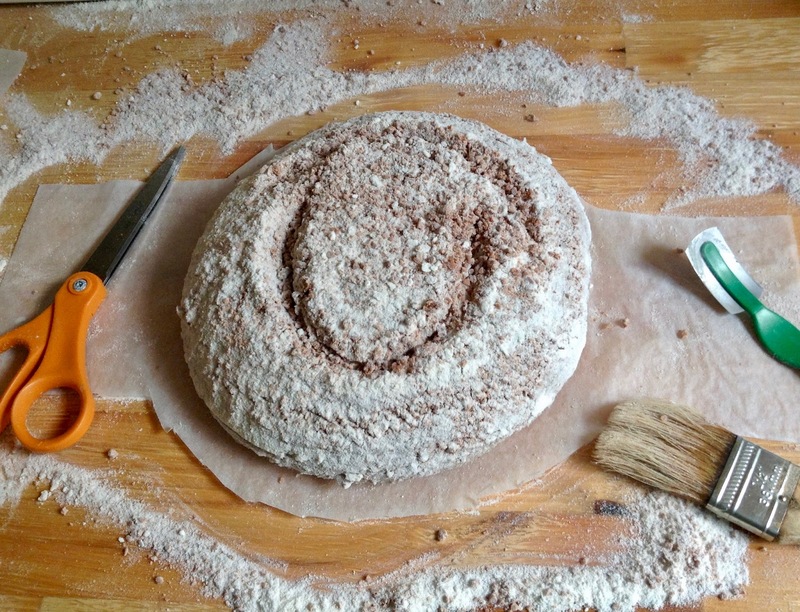 Using oiled bench knife, flip dough around, so that the floured side is down. 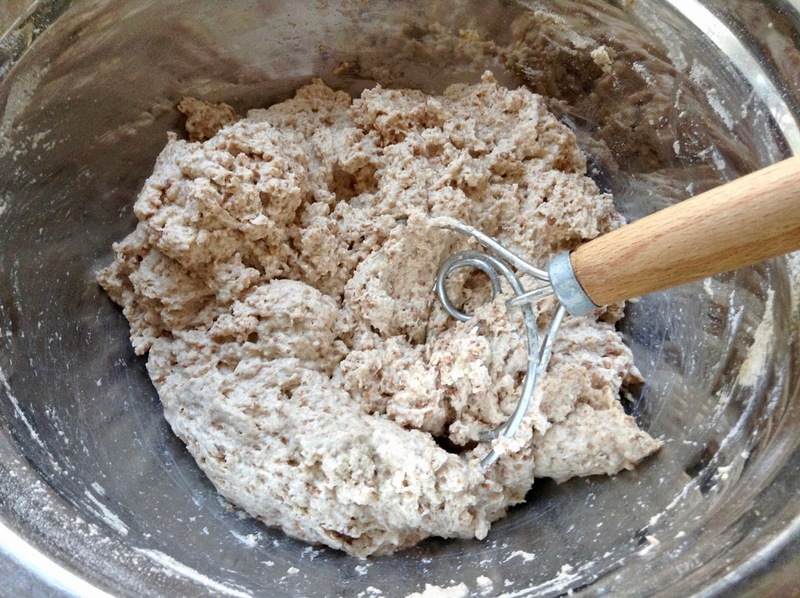 With floured hands, fold bottom end of dough up to a third, then fold both sides over the center to elongate. Fold top down to the center. Now fold the bottom again to cover top fold, so that package is closed. Flip dough package over to the un-floured part of the counter, so that seam is underneath. 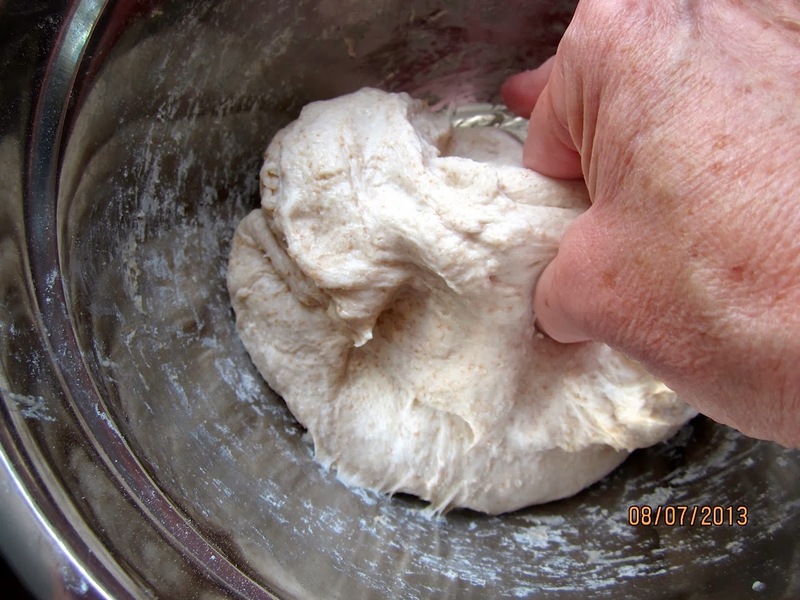 With both (floured) hands, rotate dough ball, pulling it towards you, to tighten it. Place shaped loaf, seam-side up, in rising basket. Sprinkle with flour, cover with plastic wrap, and place it in the refrigerator overnight. (No warming up necessary!). Preheat oven to 500ºF/260ºC, with a Dutch oven (with lid) in the middle. Place a large piece of parchment paper on the counter. 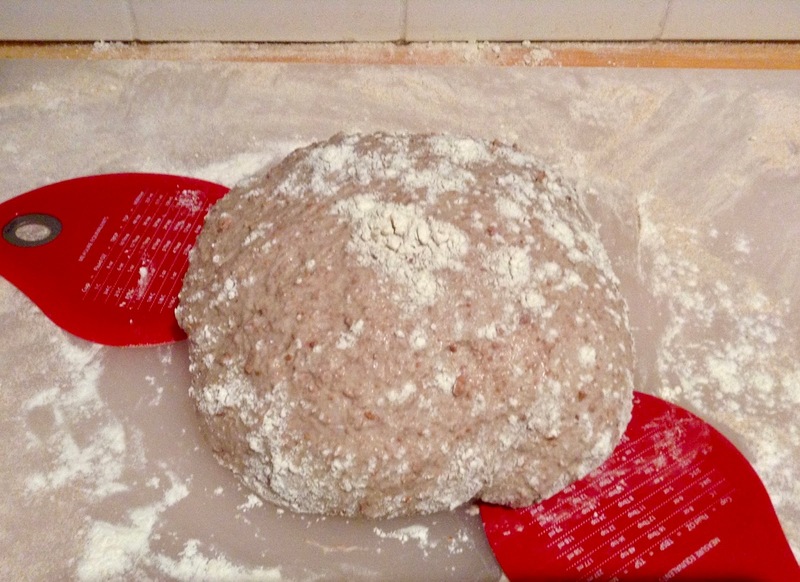 With an energetic smack of the rising basket on the counter, turn bread out onto the parchment paper. Cut paper around loaf into a sling with 2 wide handles (see photo), and score bread (brush off excess flour from the parchment). Remove hot Dutch oven from the oven, take off lid (I leave an oven mitt on the lid to remind me it’s hot). 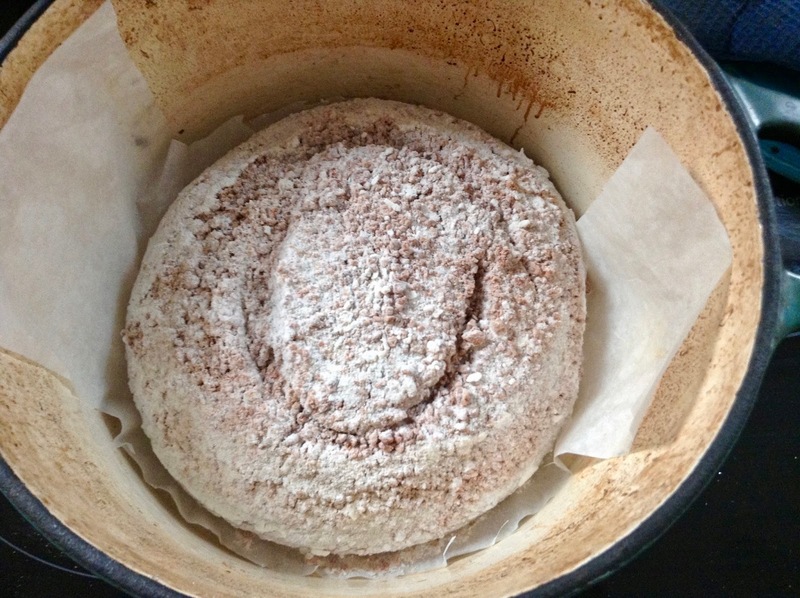 Transfer bread with paper sling into Dutch oven. Replace lid, and put it in the oven. 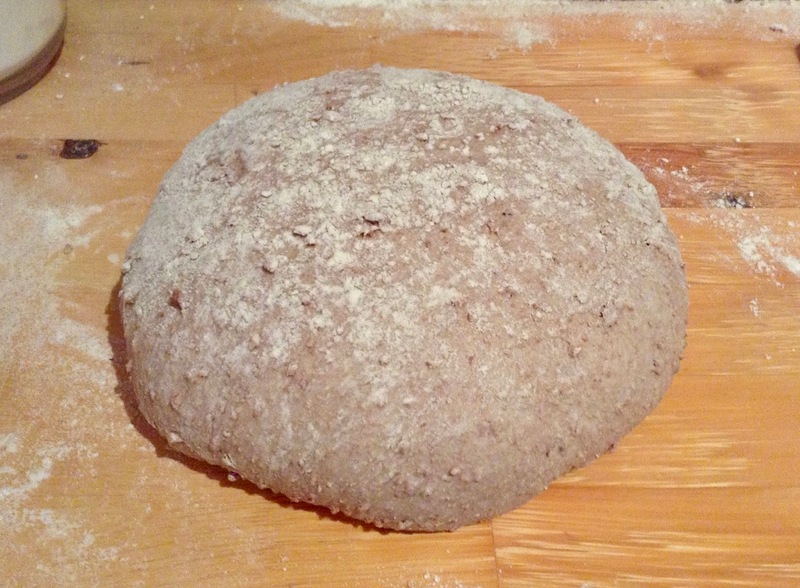 Bake bread for 20 minutes, then reduce temperature to 450ºF/230ºC and bake for another 10 minutes. Remove lid, and continue baking for another 20 – 25 minutes, until loaf is golden brown (internal temperature at least 200ºF/93ºC). Turn bread out onto wire rack and let cool completely before cutting it. Next Post BROWNIES OR COOKIES? – BROWNIEST COOKIES! What an intriguing bread! I am amazed at your determination – it looks and sounds delicious! Ginger, this was a fun project! As a child we went around in the neighborhood, gathering acorns and chestnuts to make little gnomes from them. I always regretted that you couldn't do anything else with the acorns.